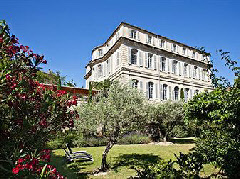 This eighteenth-century chateau has the great fortune of being located at the foot of Mont Ventoux, almost right at the heart of Provence. Moreover, being family-run and with 30 rooms, Chateau de Mazan is a little more intimate than a great deal of hotels in the south of France. The Chateau itself is the former residence of none other than the Marquis de Sade, and where, in 1772, he organised the first ever Theatre Festival in France. The hotel features its own restaurant L’Ingenue, a bar and an outdoor swimming pool. The historic city of Avignon is little over 20 miles away to the south west.